1. What happens if bulbs are connected in series? In parallel? 2. How does an ammeter work? DC Circuit Builder is an open simulation that is flexible enough to run a variety of basic laboratory experiments. The labs provided below can be completed with or without additional equipment (light bulbs, batteries, wires, multimeters). why does your sim show the current flowing from positive to negative? We spent some time thinking about whether we wanted to show the direction of election flow or of positive current, and decided to go with positive current flow for our beginning students. I forgot to mention this earlier, but be sure to check out the “Drude Model Conduction” simulation, which shows how electrons actually behave in a metal. Pair this with the “Circuit Electron Flow” simulation, and you should have a pretty complete description of what is happening inside the wires when an electric field is applied. This includes both the transient and steady state response. 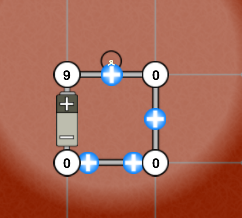 Found a potential error: For a series circuit, two bulbs of different resistance are showing the same brightness. They should be different brightness as they have a different power output (same current, different resistance – P=I^2R). Nice catch! I’ll try to fix it by tonight. Fixed! Try it out and see what you think. Hmm. I am still getting two bulbs having differing resistance values having the same brightness. Is my physics wrong? P.S. Being second year physics teacher – I stumbled across this gem: http://www.chs.d211.org/Science/brucecj/Physics.htm . Your notes have been a great help. Thank you. Weird. The fix is working okay on my end. The bulbs are now showing different brightnesses when they have different resistances in series. Might a browser refresh fix the problem? I just uploaded a new version with switches. Check it out! You will need to clear your browser cache in order to see the new version. stupid question. I use the ammeter tool and it gives me different reading for the current depending on the distance the probes (black and red parts) in the simulation. What is going on? How do I get an “accurate” reading? Great question! In general, for a voltmeter you should stick the two probes of a voltmeter as close as possible to the two sides of the circuit element you want to measure. This is because there is actually a very small (not zero!) resistance in the wires. Measuring current with the ammeter is different, however. The key here is that by inserting the ammeter, you are actually adding a new flow path to the circuit. To use the ammeter properly in DC Circuit Builder, try removing a wire first, then replacing the wire with the ammeter. For an illustration of how to do this, check out Recommended Lab above “#1 – Voltmeters and Ammeters Lab”. In part III, you will explore the proper use of the ammeter in detail. Does this help? If not, send me a screenshot and I will take a look! Hi. How come when you short a circuit with bulbs in parallel, the bulbs stay lit? They dim, and the current goes way up, but the bulbs don’t go out all the way. I would expect the bulbs to go out. For a real circuit with a real battery, current will not reach the thousands of amps you see in the simulator. For a real circuit with a real battery, a large portion of the energy loss occurs within the battery itself, with very little lost within the bulbs. In order to simulate the internal resistance of a real battery, simply place another resistor in series with the battery. You should find that the bulbs behave the way you would expect, and the current will be much lower.